Hey everyone! I'm beyond excited about my post today! I don't if it's for my cute little Eiffel tower charms or the because of the how cute these came out. Who can resist polka dots and nail charms together, I know I can't! 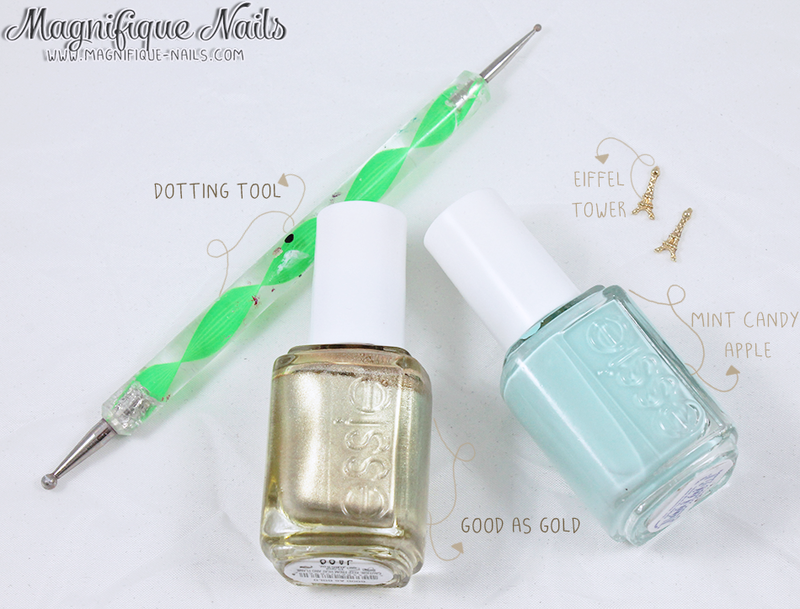 :) Well for today's post I have exactly that; Golden Polka Dots and my all time favorite nail charms. First I started with two coats of Essie's Mint Candy Apple, for the base. I love this color; perfect for the upcoming spring or summer. As I mentioned on previous post, I had one week obsession with polka dots (as you can see :D). I really don't why, possibly to see how some of the colors mesh together. Definitely these do! Once the polish dried, using a dotting tool I added the dots (in large version, however smaller one will do) starting below the cuticle and working down towards the tip. I then continued to finish the design, adding more dots to the side. I used Essie Good as Gold (which by the way is my all time favorite! ;). For the charm, I added a thin top coat (were I will place the charm.) You can also use a nail glue, for the charm to be more secured. However, if your like me, I recently have been experimenting with gels (including top coats) and found them to be easy to use as well. I personally am not a fan of nail glue (bad experience); so I found clear gels to be a great alternative. To each his own! I then sealed the design with Duri- Super Fast Dry Through Top Coat, that's it! Overall I really loved how these turned out. 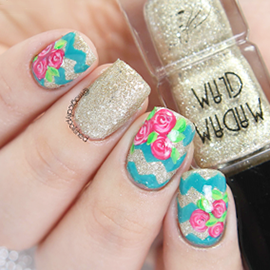 I just love the teal and gold combination. And it was super easy to do! Here's a tutorial I created. Enjoy!